In measuring an angle by a protractor, first we need to know what a protractor is. It is an instrument for measuring or constructing an angle of a given measure. It is a circular or semicircular piece of metal or plastic. 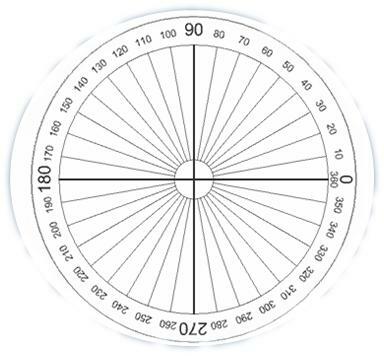 It is a circular protractor which is marked in degrees from 0° to 360° from left as shown in adjoining figure. 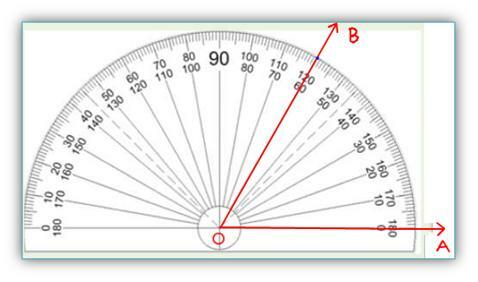 It is a semicircular protractor which is marked in degrees from 0° to 180° from left as shown in adjoining figure. 1. 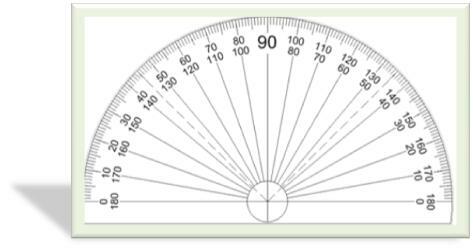 Use your protractor to draw 60°. The centre O of the piece is also the midpoint of its base line. In order to measure ∠AOB, place the protractor in such a way that its centre is exactly on the vertex O of the angle, the base line lies along the arm OA. We need to read the mark through which the arm OB passes, starting from O on the side A, as we observe in the above figure. Thus we find ∠ AOB = 60°. 2. Use your protractor to draw 90°. Thus we find ∠ AOB = 90°. Interior and Exterior of an Angle. Measuring an Angle by a Protractor. Construction of Angles by using Compass. Geometry Practice Test on angles.